Earlier this week, I visited Tina La Rosa’s classroom to watch her implement a Learning Situation with her students. Tina teaches three courses at Galileo Adult Centre, EMSB. Tina’s courses include: ENG P105-4 Stepping Out, ENG P106-4 Lifestyle Options, and ENG P107-4 Engagement and Involvement. During my visit, I saw Tina’s students use a “visual thesaurus” from the The Free Dictionary website. 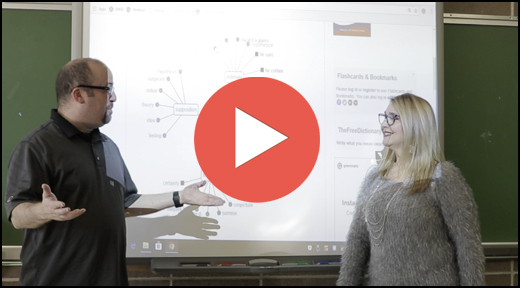 More than just a thesaurus, this online tool helps students make connections between words by showing an interconnected map of related words. The best part? Tina leaves the tool up on her teacher computer + SMARTBoard so her students can use it anytime during group work. They can also use the tool on their own devices too. Note: Like this tool? You may also want to check my previous blog post about Visuwords. It’s a visual thesaurus/dictionary tool that is similar in style and function. This entry was posted in In the Classroom, Teacher Feature and tagged free dictionary, thesaurus, tina la rosa. Bookmark the permalink.